Practical : Our wine magnets attach through ALL your stemware, even your stemless glasses, so they are the UNIVERSAL drink marker. Delightful: Your guests will wonder how a magnet is sticking to glass, and when they discover how they cleverly work, they will say, "Why didn't I think of that?" Conversational: In a room full of strangers, your guests will have something to talk about - "Have you seen this kind of wine charm before?" "Which charm did you get?" They are great conversation starters. Quiet: Our charms do not dangle and clank with every sip, they attach firmly and stay attached until you remove them. Collectible: Watch out! Many of our customers get hooked on our charms and pick out favorites for every reason and season. With over 40 designs on Amazon we are the largest supplier of magnetic charms in the US. And the best part? We handcraft them in the Midwest to make sure the quality you receive is the highest on the market. Giftable: Simply Charmed's Magnetic Wine Charm sets make wonderful hostess gifts, birthday presents, Christmas gifts and stocking stuffers. Treat the wine lover in your life with a truly unique gift. Our Promise to You If you are unhappy with your purchase for any reason, contact us for a FULL REFUND, no questions asked. So if you're not 100% satisfied, don't hesitate to let us know. Click the "Add to Cart" button at the top of the page to place your order, you'll be so excited you did the next time you entertain! PERFECT GIFT FOR ELEPHANT LOVERS! 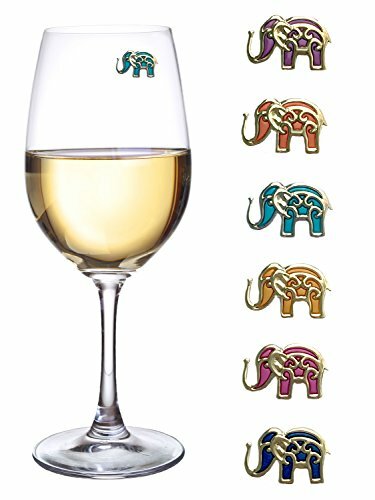 We all know someone who loves elephants, and these magnetic wine charms would make a perfect birthday gift or hostess gift , plus they are so unique you know your gift will be original! WHY MAGNETIC WINE GLASS CHARMS? Magnetic wine markers are fabulous because they work on all of your barware. They attach firmly through the glassware with two strong magnets and therefore work on stemmed or stemless glasses. YOUR ELEGANT AND CLASSY UNIVERSAL DRINK MARKER Your guests will love the simple but clever function of these wine charms and they will appreciate that they stay put and do not dangle or clank. Everyone will know which cocktail, martini, whiskey or cabernet is theirs all evening! MODERN TWIST ON WINE ACCESSORIES Unlike hoop wine charms for glasses which dangle and clank, magnetic drink charms attach securely until you remove them. Your guests will love this new style of charms for upscale or casual entertaining. GREAT WINE GIFT Our wine charms make a lovely hostess gift or gift for any wine lover . With our 30 day no questions asked 'Love it or return it guarantee', grab a set today and be ready to charm your guests the next time you entertain. If you have any questions about this product by Simply Charmed, contact us by completing and submitting the form below. If you are looking for a specif part number, please include it with your message.